Many years ago, I bought a house with an established asparagus bed. When I moved in, the season had just ended, so I had to wait almost a year to harvest. The following spring, I examined the bed daily, almost hourly, to look for the first green spears poking up through the mulch. 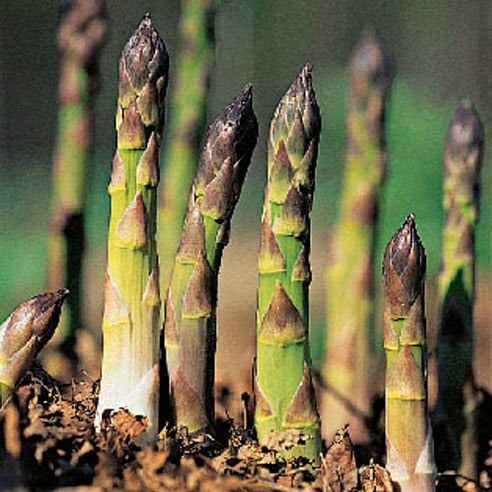 During that first season, I ate asparagus two or three times a day: asparagus with poached eggs, asparagus risotto, asparagus with hollandaise. My favorite way of eating it was, and is, to dip the still slightly crispy spears into melted butter; it’s satisfying to have the butter trickle down my chin as I chew. Some years later, when I belonged to a community garden in Washington, DC, I planted asparagus and waited the then recommended two years to harvest. I didn’t have as many plants as before, but I enjoyed this asparagus just as much. A few years later, when I left the garden, I transplanted the asparagus to space behind the building where I lived. I wonder now if anybody finds the asparagus, recognizes it, and enjoys the treat. I fear that the gardener just mows it down when he begins the springtime cleanup. My thoughts always turn to asparagus when spring arrives. It began appearing in Italian markets about three weeks ago. Those first bundles of green spears seemed lonely, having been shipped in from Spain or North Africa. The prices were high, and no vegetable seller wanted to invest in too much of the high-priced commodity; they had only a bundle or two on display. Last week, the local asparagus popped up in profusion—rows of neat bundles stood at every market veggie stall in preparation for Easter. They lured me to open my wallet. I brought home a bundle, and using the process Julia Child outlined in The Way To Cook, I snapped off about an inch from the bottom of each spear. I stood the spears in tall containers with about two inches of water in the bottom and covered them loosely with plastic bags. 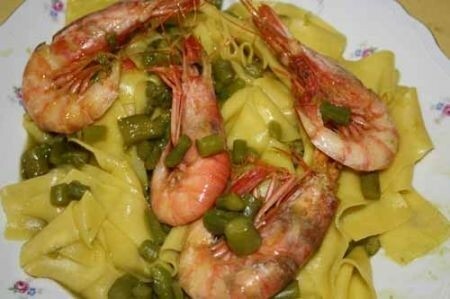 I’ve been feasting on all my favorites, but I also tried out a new recipe for Pappardelle agli Asparagi e Gamberi—Pappardelle with Asparagus and Shrimp. Pappardelle are extra wide noodles (about 1/2 inch) but you can substitute other pasta. 1. Clean and cook the asparagus until just tender. It should be somewhat underdone because it will cook more in the sauce. 2. Remove the tips and set aside. Cut the remaining asparagus into rounds. 3. Meanwhile, melt the butter and add the chopped onion. Cook until soft, but do not brown. 4. Add the shrimp and cook until it is no longer transparent. Add the white wine and cook to evaporate. 5. Add the asparagus rounds, reserving the tips for garnish. 6. Stir in the cream, cooking and stirring for another minute or two. Season with salt and pepper to taste. 7. In the meantime, cook the pasta. Drain, reserving a part of the pasta water. 8. Add the pasta to the sauce and stir to mix, adding some of the reserved pasta water if it seems too thick. 9. Divide the pasta among four plates, garnishing with the asparagus tips. Oh, it is. Give it a try. I'm going to try it with some different seafood, scallops or mussels, next. That sounds so scrumptious! I think scallops would be good, too! Happy Spring, Patricia! Asparagus is one of my favorite vegetables. I don't grow it myself but I look for it at the farmers market and buy it every week as long as it lasts. My favorite way to eat it is steamed with a sprinkle of salt and lemon juice. The meyer lemons from my tree do the honors. But I will try your recipe. It looks yummy! Kaye, Happy Spring to you, too. Heidi, asparagus with lemon is good. I envy you your lemon tree. To you both, this is a really good dish; you can use other forms of pasta, but the wide noodles are nice. Oh, thank you for the recipe. My all time favorite vegetable. I'll gobble my share and yours before you can dip in butter or drizzle sauce. Forget a fork. Mine, mine, mine. Hmm. Maybe we need to plant some in the new veggie garden? Sounds like I'll need my fork to fight you off my plate. Asparagus isn't hard to grow once you get it established. You should buy year-old crowns, and now the recommendation is that you can harvest them the next year. And unlike bulbs, it doesn't matter which end is up when you plant. Doesn't matter which end is up when we plant? This is our kind of planting! Year old crowns! Thank you. My dad planted asparagus as soon as they moved into their last house and had years of harvests. The flaw in that plan was that they lived in S. CA and I lived in the South. I had to settle for apricot slubs that Dad would ship to me. Favorite fruit. Apricots. Unfortunately, the only asparagus available locally is the tinned kind, do you know if it can be grown in the tropics or do I have to stick to the tinned kind? Geets, I'm not sure it can be grown in the tropics. It's a spring food, so perhaps it likes cooler climate. Is it available frozen? We have that in the U.S. and here in Italy, too. Not as good as fresh, but much better than tinned. Nope we don't get it frozen, which is surprising as we get a lot of other frozen veggies. I'll try the recipe with the tinned kind, I like pasta too much not to! I think I may try my had at growing some asparagus...the worst that could happen is that they don't grow. You grow it using a bundle of roots called "crowns." I think it can be grown from seeds, but it takes years. In the U.S., you buy year-old crowns and plant those, then wait a year to harvest. 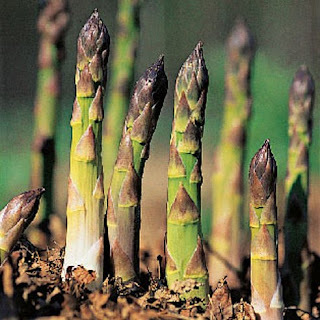 Once established, an asparagus bed goes on forever. My brother found some growing along an abandoned railroad track, dug them up, and harvested them for quite some time.